There are a number of safety features built into the barchetta. 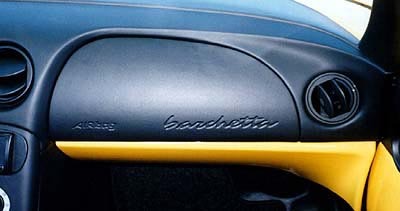 Some of them are well known as they are in every modern automobile, some are barchetta specific. Some are explained in the standard brochures and manual, some aren't that easily to find. Of course this website will list most of these safety features in detail. The barchetta can withstand a roll-over thanks to a reinforced windscreen frame. At both sides of the windscreen is a 24 mm diameter tube made of 4 mm thick alloy. This material is made of an alloy with a low carbon content, a low quantity of molybdenum, vanadium, manganese, niobium or titanium of a very fine structure. The tensile strength of this material lays between 35 - 49 kg/cm², which is 120 to 130 percent higher than regular materials. A standard barchetta has one airbag, although in some countries barchettas are sold with a driverside airbag aswell (Germany, UK when ordering the comfort pack). The driverside airbag has a capacity of 42 litres which will be filled with 55 liters of a non-toxic gas (90-95% nitrogen) within 30 msecs. The passengerside airbag is 90 litres when inflated. An electronic sensor in the control-unit on the tunnel of the car in combination with a mechanical sensor recognizes the deceleration at a frontal crash. If this deceleration is higher than 28 km/h (detected by the electronic sensor) and higher than 2.2 ± 0.4 g (detected by the mechanical sensor), an ignitor will trigger the gasgenerator which start a chemical reaction by igniting approx. 85 grams natriumazide, thus inflating the airbags. The airbags are connected to a energy buffer (a capacitor) which will make it possible to ignite the airbags up to 100 msec after the power of the battery has been cut (e.g. due to an accident). Also it will ensure the ignitors will work, even when the battery power is below 7 Volts. Like the airbag, the seatbelt pre-tensioners are pyro-technical devices. These will be ignited during a frontal crash against a solid object at a velocity of more than 24 km/h. Up to three crashes at a speed of more than 24 km/h but less then 28 km/h (thus triggering the seatbelt pre-tensioners only) can be recorded by the electronic control unit which is mounted on the tunnel. When the airbag has been triggered aswell, a new control unit must be installed, as the Crash Memory will be filled with data. The control unit can withstand electromagnetic radiation aswell as reverse polarity (in case someone screws up when connecting the battery). It is also smart enough to recognize a crash so it won't trigger the pyro-technical devices when driving through a pothole: after the high initial deceleration a low deceleration or even acceleration occurs because of the crumple zones of the car. Then high deceleration occurs again as the safety cage is involved, ending in a full stop. To prevent fire due to leakage of fuel, an inertia switch will cut the power to the fuelpump. This switch is operated by a steel ball which is held in place by a magnet. At a deceleration of 1.2 g (25 km/h), the ball will escape the pull of the magnet, hitting a switch. This switch can be reset by pushing the knob on the left hand side of the driver seat. These include ABS, anti-submarining seats, side impact beams in the doors and reinforced doorlocks.